At some of these we balked. We thought we could find an easier, softer way. But we could not. With all the earnestness at our command, we beg of you to be fearless and thorough from the very start. Some of us have tried to hold on to our old ideas, and the result was nil until we let go absolutely. Remember that we deal with lust—cunning, baffling, and powerful! Without help it is too much for us. But there is One who has all power—that one is God. May you find Him now. Half measures availed us nothing. We stood at the turning point. We asked His protection and care with complete abandon. 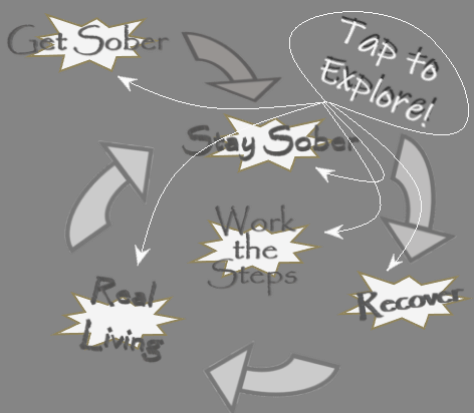 Below are the steps we took, which are suggested as a program of recovery . . . The reading above has been reprinted and adapted with permission of Alocohlics Anonymous World Services, Inc. To continue the reading and see the 12 Steps of Sexaholics Anonymous please click on the green button below. While the journey of working the program of the 12 Steps is unique to the individual, there seem to be some distinctive markers along the way. To explore phases of an SA member's active participation in the Fellowship, please click on the blue button below. Following the guidelines set out in the Twelve Steps of SA, we find a pathway to a happy, joyous, and free way of life. Working the Steps lies at the heart of recovery. 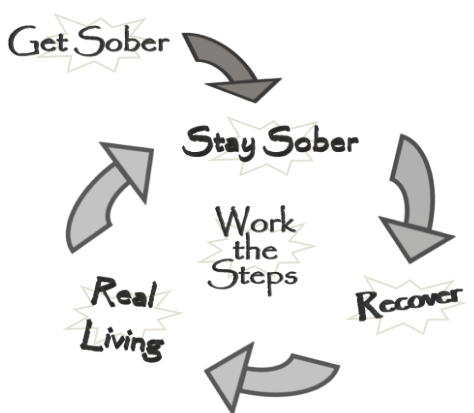 Step work will require spending time and effort on each of these twelve stages of our recovery journey; and is usually accomplished with the guidance of another, more experienced member of the fellowship, usually our sponsor. Sexaholics Anonymous's version of AA's Twelve and Twelve is the Step Into Action volume—and it serves as a reflection of the collective experience, strength and hope of the SA Fellowship in working the Steps. We admitted that we were powerless over lust—that our lives had become unmanagable. Made a decision to turn our will and our lives over to the care of God as we understoon Him. Having had a spiritual awakening as the result of these Steps, we tried to carry this message to sexaholics and to practice these principles in all our affairs. Many of us exclaimed, "What an order! I can't go through with it." Do not be discouraged. No one among has been able to maintain anything like perfect adherence to these principles. We are not saints. The point is, that we are willing to grow along spiritual lines. The principles we have set down are guides to progress. We claim spiritual progress rather than spritual perfection . . .
That we were sexaholics and could not manage our own lives. That probably no human power could have relieved our sexaholism. That Goud could and would if He were sought.